Do you sometimes gaze at your sleeping cat and wonder what the point is? Sleeping 16-20 hours a day is a wonderful thing to do, but what is this creature contributing to the world? Maybe it’s just jealousy, but we got obsessed with this problem and decided to find out. Here are some pointers on just why your kitty finds it hard to drag themselves out of bed for more than 30% of the day. It’s no accident that our little cats look so much like their wild lineage. Just as you’ve always suspected, they are basically all mini lions and tigers. Those guys have to save up their energy to chase down their food everyday, so they have a legitimate reason to be lazy. Our guys though? Totes not legit. About 75% of the time your kitty looks like they’re sleeping, they’re still on high alert. That’s why they’re glaring at the plastic bag you just rustled when you came into the room. The rest of the time they are deep in actual sleep, dreaming of houses made of mice tails and fish fillets. Ok, let’s admit it. They get up and do stuff sometimes. Because they are so #wild, they can’t help having a play/homicidal hunt at dusk and dawn. Fresh from a 12 hour nap, they awake ready to sink their claws into the many zebras and gazelles that roam your hallway. When they can’t find a zebra though, they just uselessly burn energy through activities such as zooming, meaningless meowing and making art on your furniture with their claws. Those are their excuses, anyway. We’re going to look into the sleeping habits of apes and see if there is any extra sleep we can justify with that. 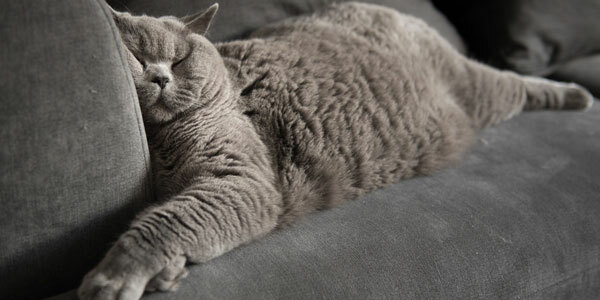 Now that you know why your cat has dedicated his or her life to unconsciousness, check out our blog post, What’s your kitty’s snoozing style?